Be the first to share your favorite memory, photo or story of Alton. This memorial page is dedicated for family, friends and future generations to celebrate the life of their loved one. BROOKLYN-Alton Roy "Babe" Erickson, age 83, of Brooklyn, passed away peacefully on Saturday, July 7, 2018, at Sienna Crest Assisted Living after a brief illness. He was born in Stoughton on July 9, 1934, the son of Edward and Annie (Johnson) Erickson. Alton was drafted into the U.S. Army during peacetime in 1957, and spent 15 months in Germany. He worked at Uniroyal Engineered Products in Stoughton for over 40 years before retiring. 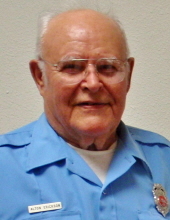 Alton was a firefighter with the Brooklyn Fire Department for 59 years, serving two terms as assistant fire chief. He took pride in and worked hard maintaining the building and equipment. He was looked up to for his knowledge of safety at the fire scene and was the best fireman at putting out grass fires. The fire was not out until Alton said it was! At the time of his death, he was the longest active Brooklyn Firefighter in the history of the department. Alton was a member of the Community United Methodist Church in Brooklyn, Madison Area Iris Society, Wisconsin Hardy Plant Society, and spent one term on the Village of Brooklyn Board. He was a mentor to many and an adopted father and grandfather to neighbors and friends alike. Alton is survived by sons, Christopher Erickson of Killaloe, Ontario, Van of Brooklyn and Jens Erickson of Verona; sisters-in-law, Grace (Casey) Neath and Jean Anderson; many nieces, nephews, friends; and special friends, John Beranek and Joanne Van Norman. He was preceded in death by his parents; wife, Lila (Elmer) Erickson; sister, Edith Heller; and brother, Archie Erickson. Funeral services will be held at COMMUNITY UNITED METHODIST CHURCH, 201 Church St. Brooklyn, at 10 a.m., on Saturday, Aug. 4, 2018. Burial will be held at Mount Hope Cemetery. Visitation will be held at GUNDERSON OREGON FUNERAL AND CREMATION CARE, 1150 Park St., Oregon, on Friday, from 4 p.m. until 7p.m., on Friday, Aug. 3, 2018, and at the church from 9 a.m. until the time of the service on Saturday. In lieu of flowers, memorials may be given in Alton's name to Community United Methodist Church, Brooklyn Fire Department, and Brooklyn EMS Service. Special thanks to Rick, Marion, and Rosie Tong, the caregivers at Agrace HospiceCare and Sienna Crest Assisted Living for their care and support. Online condolences may be made at www.gundersonfh.com. "Email Address" would like to share the life celebration of Alton Roy "Babe" Erickson. Click on the "link" to go to share a favorite memory or leave a condolence message for the family.